At the 2008 Convention, I was one of a handful of Consultants that won a special luncheon with Dr. Magee and his wife, Kathy, the founders of Operation Smile. That day I made a personal commitment to do whatever I could, locally, to help raise money and awareness for Operation Smile. As a mom of four children, it’s heart-wrenching to imagine one of my children not being able to eat or drink due to a facial deformity and possibly even losing their life. My twin boys had TTTS (Twin-to-Twin Transfusion Syndrome), so I know what it’s like to have a doctor look you in the eyes and tell you there’s no hope for your babies. Just thinking about this brings tears to my eyes. Knowing that it only costs $240 and takes 45 minutes to perform this life-changing surgery, how can you not want to help? I’m blessed to know some of the most generous crafters in Macomb County and the surrounding counties of Michigan. It’s through their generosity that my Operation Smile crops have been able to raise over 125 smiles (as we call it). I’m merely the facilitator—they are the true heroes! This will be my seventh year holding all-day crops to benefit Operation Smile. My best advice for where to start is this: Just do it, and they will come! My very first event I had two people show up. I’m not kidding! If I had let that discourage me, I would have never continued on. Tell everyone about your event even if they don’t craft, because chances are they know someone who does. I keep my events very simple. A hall with great lighting and space for everyone to spread out is key. Plus, it’s all about the food. Trust me. 🙂 I have raffles and a grand prize showcasing the latest Close To My Heart products. 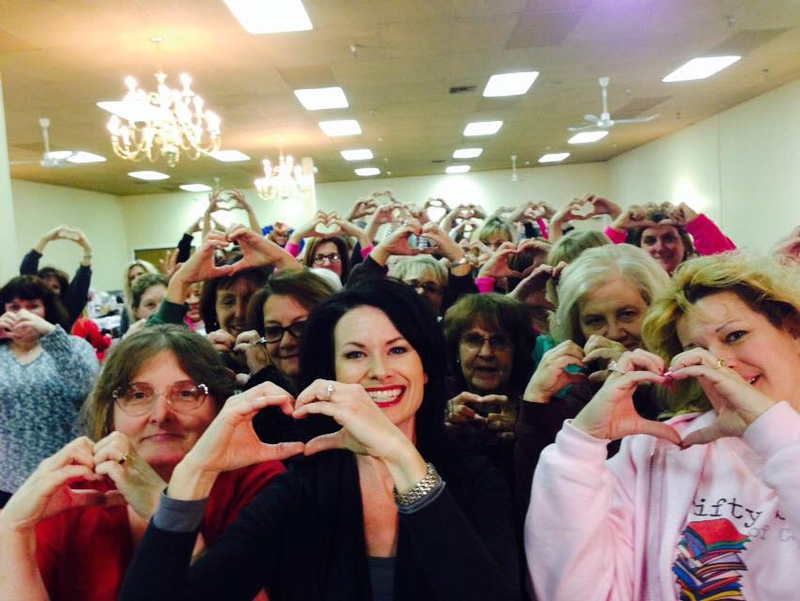 I’m there to inspire, share tips on how to use Close To My Heart products, and foster a sense of community. Holding a fundraiser is great because everyone leaves filled with joy. I wish everyone much success with their events. No matter what happens, whether you have two or two-hundred people show up, you are helping to make a difference in the life of a child! Every time I watch a video about Operation Smile, it hits me way deep down inside. I’m always so taken aback, and I wish no child ever had to experience any facial deformities. But then again, it is uplifting to know that there is something that can be done to help! 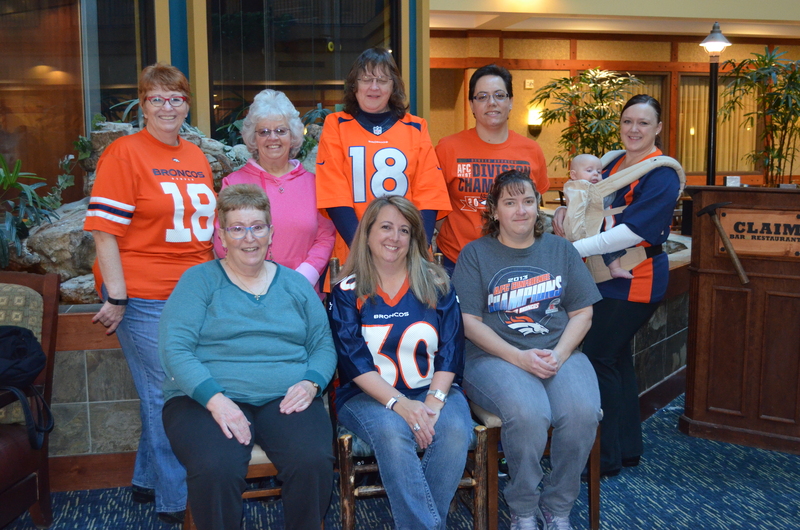 I recently organized a weekend retreat at the Embassy Suites in town. I was also blessed to have seven wonderful Downline help organize the event and bring their friends. We had a total of 52 people for the weekend! 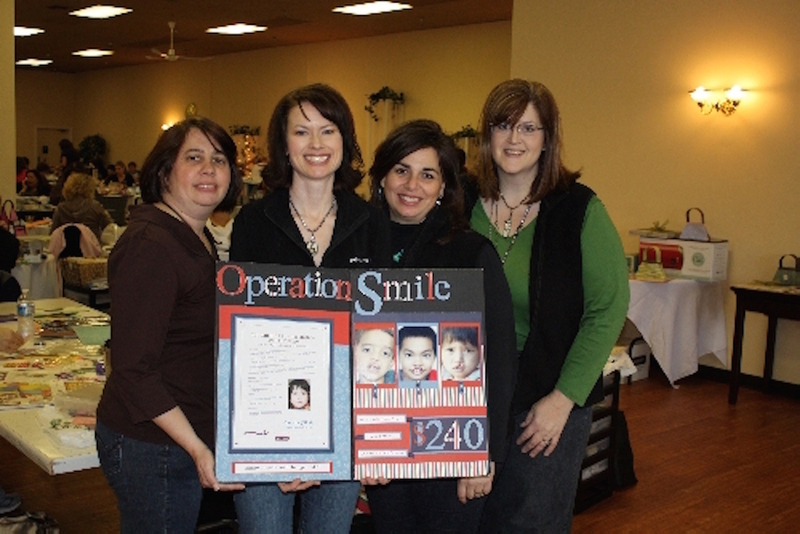 Not only was this a great Team-building event, but we went to work and raised $1,408 for Operation Smile! That is almost six smiles! My Team members and I each donated at least $50 of Close To My Heart product to give away throughout the weekend. We sold raffle tickets for $1 each to give away these goodies. Then we all created artwork masterpieces, too, donating 21 items between the seven of us to hold a silent auction. The last thing we did was to give away a $150 gift card for the next Embassy Suites retreat we will be having later this year in November. We sold tickets for this giveaway for $10 each. I think one thing that had a huge impact on how much generosity we saw throughout the weekend was sharing an Operation Smile video near the beginning of the event. It is easy to share what Operation Smile is verbally, but actually seeing what a child goes through by watching one of these videos is powerful. To help kick things off on a fun note, I also wrote my very own left right game and personalized it for our event (this game is very popular within Close To My Heart!). Everyone loved this, and it started our weekend off with laughs and high spirits. It all added up to a very successful event for me and my wonderful Team, Heart To Heart Memories! When I made it a goal to raise funds for Operation Smile four years ago, I was actively involved in Networking Groups to promote my Close To My Heart business. For three months, I changed my focus from my business to the mission of Operation Smile. I’ve found a lot of success getting donations by talking about Operation Smile in a way that reaches people’s hearts. 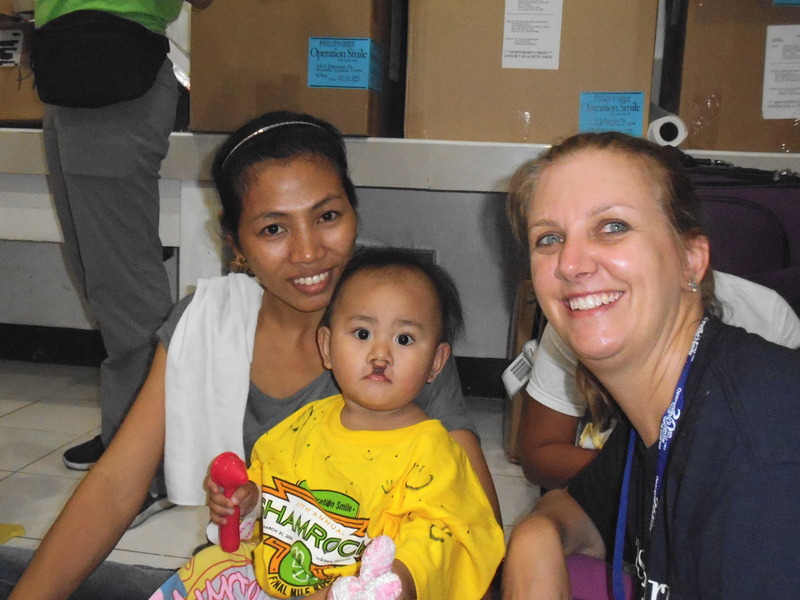 I had the opportunity to go on an Operation Smile mission to the Philippines with Brian Holman. It was an incredible experience. This is me in the pre-operation play room. First I talk about how a mother views their child as the most beautiful child in the world. I explain that mothers who have children with facial deformities still feel this way, but other people in their community may not: Children born with cleft lips and cleft palates in third world countries are typically shunned by their neighbors, their villages, and even by other children. Many do not go to school, cannot find work as an adult, and do not get married. I point out that cleft lips and palates are not as prevalent in the US because our level of medical care addresses them almost immediately. I make it a point to mention famous people who had facial deformities as children—such as Stacy Keatch, Tom Brokaw, and Peyton Manning—who would not have been successful or maybe even alive if they hadn’t received medical care. I have my guests visualize themselves as parents of an affected child, and ask how much they’d be willing to pay for their child to receive this life-saving surgery, before telling them that it only takes $240 USD to provide a surgery for a child in need. I explain that this money not only helps save their life but also helps them so they are no longer socially shunned. This little girl is Angelique. I was with her from when she was evaluated to when she was able to go home after surgery. I always wrap up with this story: My husband and I worked very hard to have the two children we have. We are so blessed that they have beautiful smiles—I don’t always like what comes out of their mouths, but I LOVE their smiles! 🙂 Because we are so thankful for our two healthy children, we donate two smiles each year so that another parent can show off their most beautiful child in the world as much as we show off ours. Very inspiring. I have not tried an Operation Smile event but am very interested in planning one! We’re glad this post inspired you! Lovely testimonies from lovely consultants! I hosted my first Operation Smile event in January and had so much FUNN! But the best part was going to my website and filling in the Operation Smile box $240.00! I pray for the little child and his/her family who will get the surgery provided by my generous “FUNN Friends”. Thank you, CTMH, for partnering with a a cause so big, so special, and letting us be a part of it, too.